But each in his own order: Christ, the firstfruits; afterward, at His coming, the people of Christ. However, this will happen to each person in the proper order: first the Messiah, then those who belong to the Messiah when he comes. But each in his own order. Christ the first fruit, then those of Christ at his coming. But each in his own order: Christ the firstfruits; then they that are Christ's, at his coming. But each in his own rank and turn: Christ (the Messiah) [is] the firstfruits, then those who are Christ's [own will be resurrected] at His coming. But each one [is raised up] in his own turn: Christ as the firstfruits [See verse 20]; then those who are Christ's [i.e., believers], when He returns. but each in his own order; Christ the first-fruit, afterward, those who are Christ's at his coming. But every man in his right order: Christ the first-fruits; then those who are Christ's at his coming. But each in his own order: Christ the first fruits, then, at his coming, those who belong to him. but every one in proper order: Christ has the precedence, next they who were Christians shall rise at his advent. But each in his own turn; Christ first, and then at Christ's coming those who belong to him. But every one in his own order: Christ the first-fruit, afterward they who are Christ's, at his coming. But each one in his own order: Christ the firstfruits; afterward, those that are Christ's at his coming. And each in his own order: the first fruit Christ; then they of Christ in his arrival. and every man in his own order: The first is Christ, then they that are Christ's at his coming. But each in his own division: ? ?Christ the first to be reaped; after that, all who belong to Christ, at his arrival. But each in his own order; Christ the first-fruits, then those who belong to Christ at his appearing. But each in his own order: Christ, the firstfruits; then when Christ comes, those who belong to him. 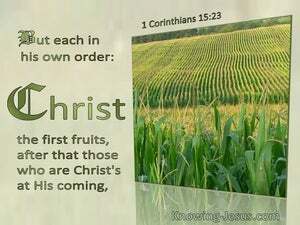 But each in his own order: Christ the first fruits, then those who are Christ's, at his coming. But every one in his own order; Christ the firstfruits, afterward they that are Christs, at his coming. But every one in his own rank: Christ the first-fruit; afterwards those that are Christ's at his appearing. But each in his proper order-Christ the first-fruits; afterwards, at his Coming, those who belong to the Christ. But every man in his own order: Christ the first-fruits; afterward they that are Christ's at his coming. But this will happen to each in the right order--Christ having been the first to rise, and afterwards Christ's people rising at His return. But each in his proper order; Christ first, then at His coming those who belong to Christ. but each in his own rank; Christ, the First-fruit; then those who are Christ's at His coming. 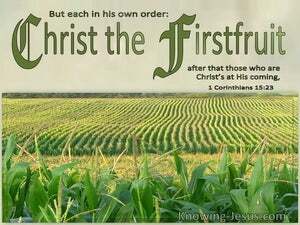 But each in their proper order: the first-fruits, Christ; afterwards they that are Christ's, at his coming. Thy dead live -- My dead body they rise. Awake and sing, ye dwellers in the dust, For the dew of herbs is thy dew, And the land of Rephaim thou causest to fall. and ye are Christ's, and Christ is God's. and if ye are of Christ then of Abraham ye are seed, and according to promise -- heirs. for what is our hope, or joy, or crown of rejoicing? are not even ye before our Lord Jesus Christ in his presence?